I was in one of my local wool stores, Wool Tyme, the other day and they had this Patons Allure in the deep discount area. 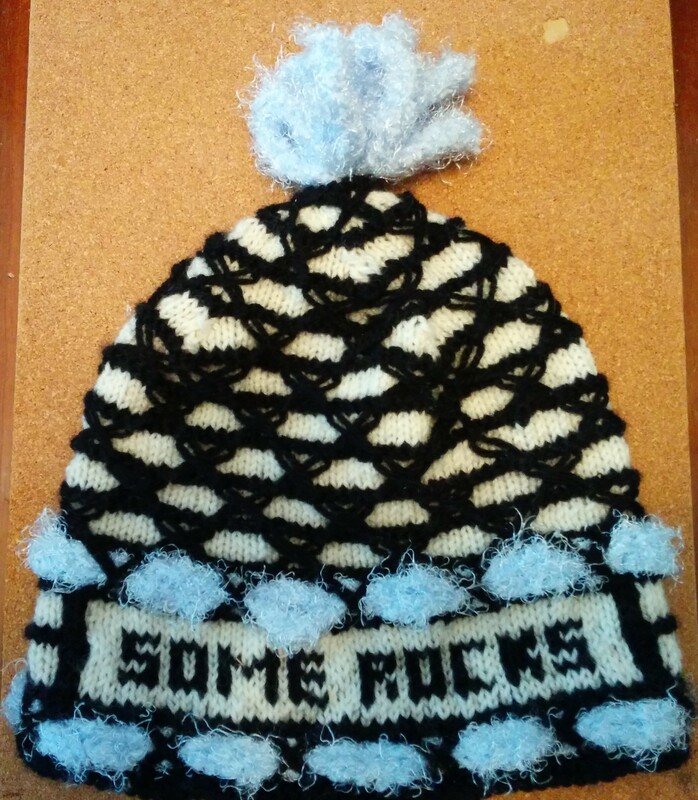 It knits like a chunky so I cast on 54 stitches and did a band of stockinette around the bottom with a 6 mm needle. I switched to Classic Wool, worsted and a 4.5 mm needles, picking up one stitch in between each stitch, doubling the stitches to 108. I turned around on the needles as I did this so the curl of the stockinette would be to the inside instead of the outside. I have done this successfully with lots of different yarn combinations. I just figure out how many stitches and which needle size I need for each yarn, then either pick up or reduce evenly around the hat as I am changing yarn and needles. It just happened that doubling the stitches was right for these two yarns, sometimes the ratio would be 4 to 5 or 3 to 2, for example. 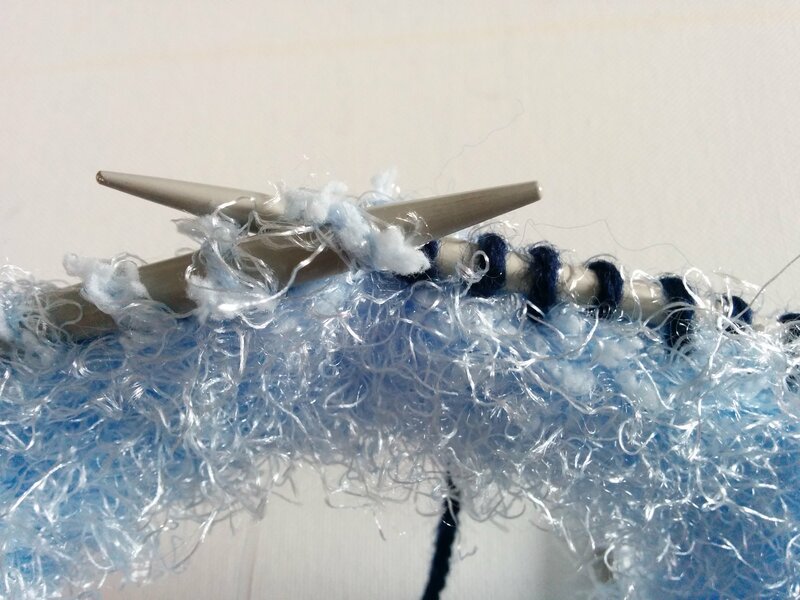 If you are going up a few needle sizes, it helps to do your last row in the smaller yarn with the big needles or things can get impossibly tight. I continued up the hat using a combination of Single Eyelet Rib and Double Eyelet Rib, pg 46. I got rid of all the Single Eyelet Ribs first, then turned the Doubles into Singles and got rid of them at the top. 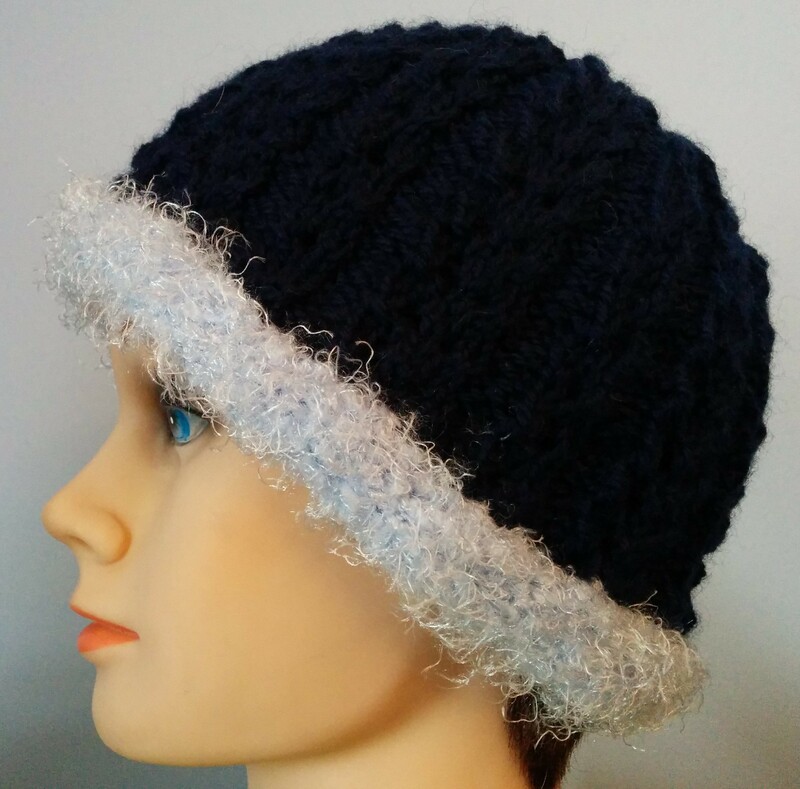 This second hat was done for a good friend of my sister in law, Anne. We were at Anne’s house and Jackie mentioned that her maiden name was Desroches. Her husband, Terry, had always jokingly called her some rocks, the English translation of her former last name. I thought this would be cool on a hat. 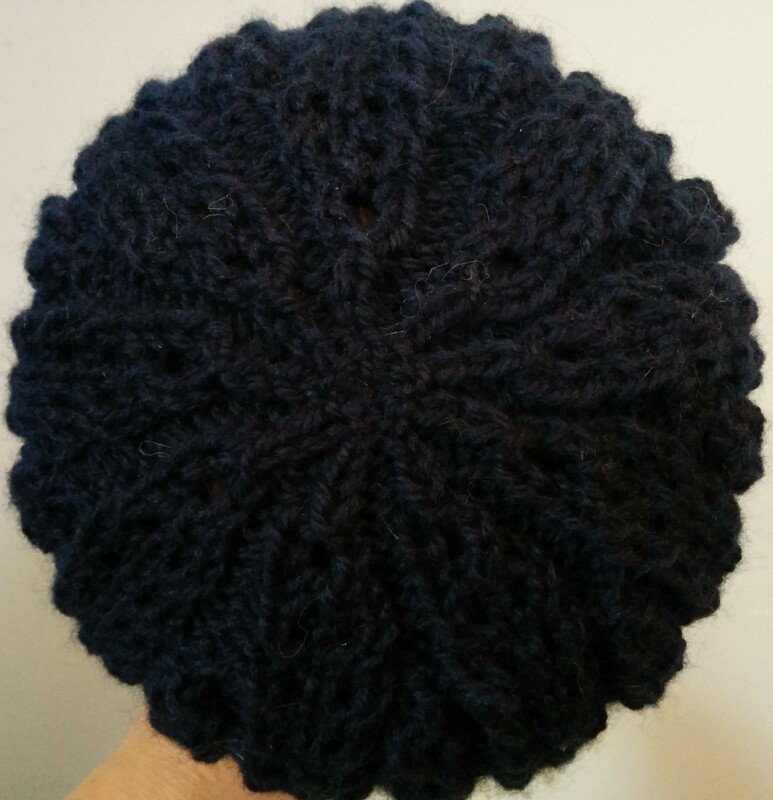 I did the hat in Criss Cross Pattern, pg 73. It looked harsh so I put crocheted bands of Allure and strung them through behind the crosses, then made a topper. I am not sure about the Allure. I may redo the bands in a flat light blue. 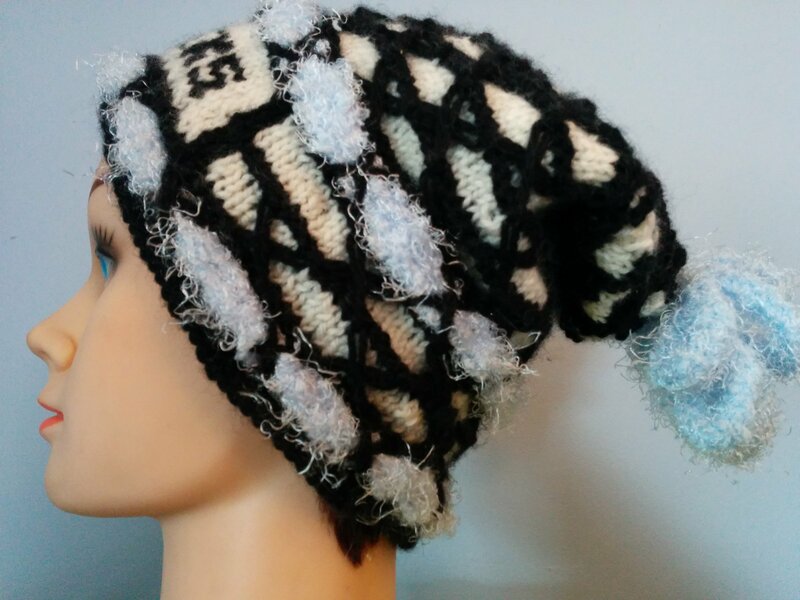 This entry was posted in Barbara Walker and tagged A Treasury of Knitting Patterns, Barbara Walker, knitted hat, Patons Allure, Patons Classic Wool on January 25, 2016 by gillianknitter.